*This post is also on What the Flicka. Check it out, here! *It is also on the Erma Bombeck Writer's Workshop website! This Just In: A Mandatory 10 Step Training Course has been implemented for all soon-to-be parents. If you skillfully and successfully endure the various challenges involved, while being tethered to a lifelike, hungry doll that cries often, you will be prepared for bringing home a newborn. If you fail, good luck to you. 1. Sleep Deprivation: All participants will experience a level of sleep deprivation the likes of which they have never known before. You will occasionally be allowed 40 minutes of sleep at one time, but you will be quickly roused by the wails of your lifelike doll. 2. Women: Overnight, your breasts will enlarge to twice their size and become sore and hard as rocks. They will leak throughout the day and night. There is nothing you can do to prevent this. 3. Men: You are not allowed to enjoy said enlargement. Not only has the sleep deprivation taken its toll on you and your spouse, but one of you is always tethered to the crying, hungry doll. You will have to wait [at least] 6 weeks to express prolonged physical affection. 4. Entertainment: On a beautiful Saturday evening, you will be forced to walk by several of your favorite bars and restaurants. You will be hungry, tired, and in need of a strong drink, but in order to successfully complete this task, you must keep walking, with the doll strapped to your chest. You will go directly to Babies R' Us and deposit your entire month's paycheck there. 5. Diet: You are allowed to eat only the following items: granola bars, frozen pizza, crackers, and brown casseroles brought to you by elderly neighbors. All food will need to be consumed standing up, hunched over the kitchen counter, as fast as you can, while enduring shrieking cries from your practice doll who is waiting to be fed again. Bonus points will be awarded for participants who hold the doll in one hand and eat with the other. 6. Bathing: Neither adult participant is permitted more than one shower for the duration of the training course. During this shower, the doll will remain in the bathroom with you and begin crying as soon as the water starts. To complete this task, you need to bathe as fast as you can to get out and comfort the doll; this means no shaving, no deep conditioning, and for heaven's sake no shower gel. 7. Attire: Keep the clothes you are currently wearing as clean as possible because you will not be provided with fresh, new clothing at any time. You will need at least 10 outfits for your practice doll, however, as it will expel simulated poop and spit up on its clothing like clockwork at every single feeding. 8. Toileting: Every time a female participant sneezes, she will pee a little. Depending on the neediness of your practice doll and your tolerance for screeching wails, going to the bathroom may or may not be your only alone time in any given day. 9. Grooming: All participants will quickly notice more gray hair sprouting from their heads. You are permitted to use tweezers on these new strands, but you will likely be too depleted (see #1 and #5) to use them. No haircuts, no make-up, and certainly no toenail trimming will be tolerated during the training course. 10. Escape Route: There will be times when you want to run away with your hands in the air, laughing like a lunatic, or hide in a dark closet tucked into a fetal position, but remember this: there is no turning back. Despite the practice doll's powerful life-sucking abilities, you will come to love it more than you thought possible, and you might even get used to having spit-up on all of your clothing. Psssst! Clash of the Couples, a HILARIOUS book I contributed to, is available now on Amazon, and more! 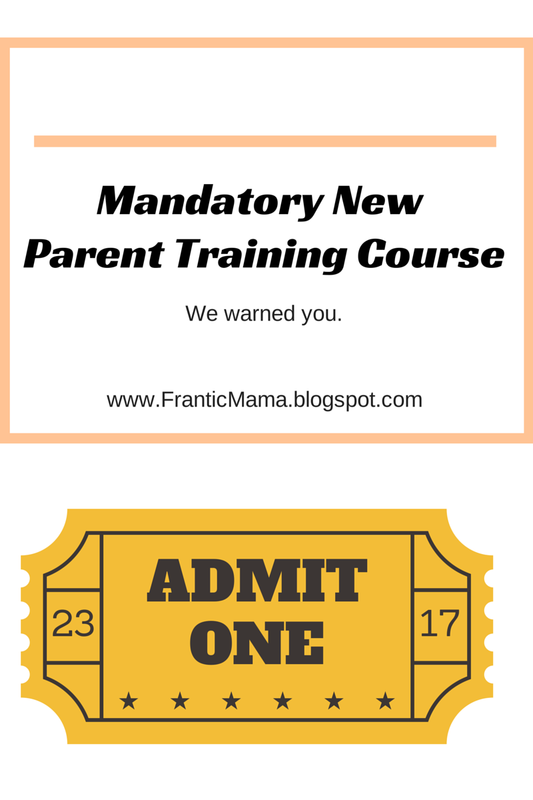 Find Frantic Mama on Facebook and Twitter!